It’s not all about the first rounders here at PFF. Each week we’ll bring you a few rookies whose names weren’t called among the first 32 picks of the NFL draft, yet they still impressed with their preseason performances. 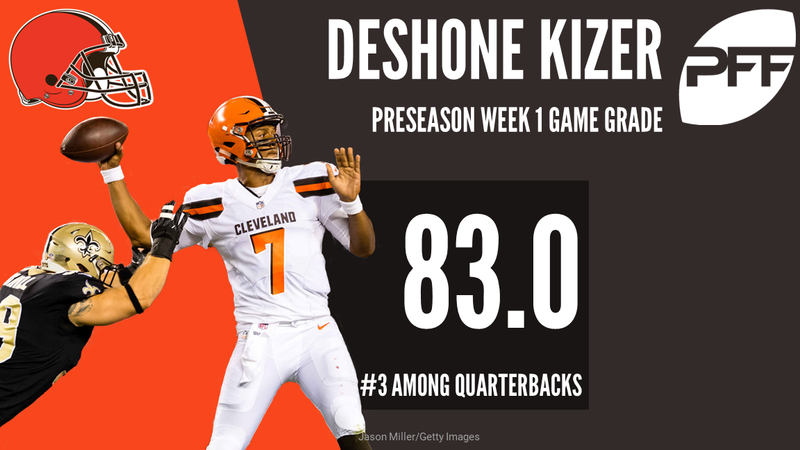 Expected by many to be a first round pick in the lead up to the draft, Kizer looked like he should have been in his first preseason action. He led all quarterbacks who had more than five dropbacks under pressure with an 83.3 adjusted completion percentage on those throws and he was absolutely lethal when the Saints blitzed, completing six of nine passes for 99 yards and a touchdown, good for a 140.5 QB Rating. Kizer didn’t just live underneath either, the Notre Dame alumn completed five of his eight attempts that traveled at least 10 yards in the air downfield with a perfect 158.3 QB rating on those throws. 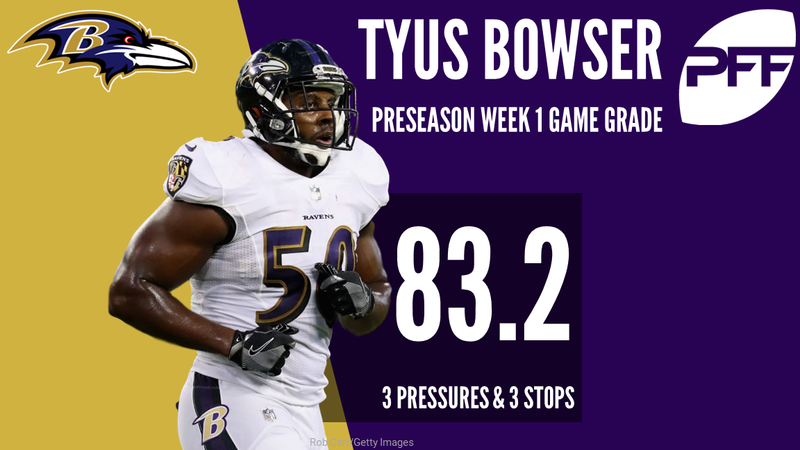 Bowser ranked 10th out of 114 qualified edge defenders with a 22.5 PRP in this weeks preseason action after he racked up three total pressures (including one hit) on just ten pass rush snaps. Bowser ranked 25th out of 328 qualified FBS edge defenders last season with a 14.2 PRP. 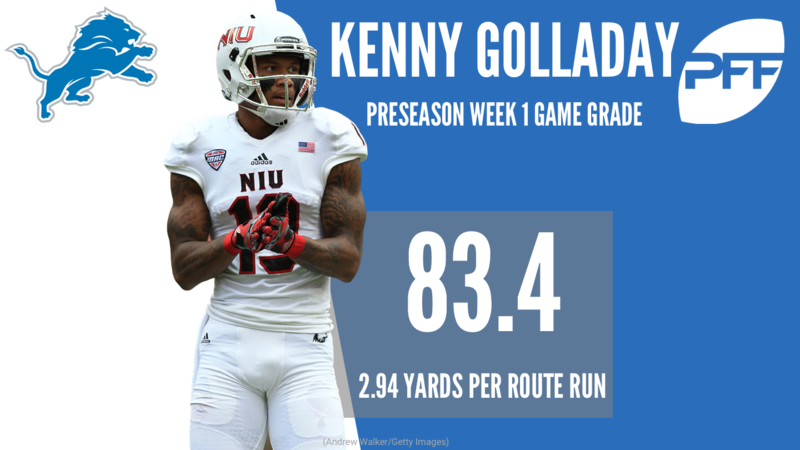 Golladay was a force for the Lions in his first preseason action, catching three of the four passes thrown his way for 53 yards and two touchdowns en route to his 83.4 overall grade. Golladay’s best play was to open the scoring against the Colts by hauling in a 23-yard touchdown pass by outmuscling rookie second-round corner Quincy Wilson down the left sideline. 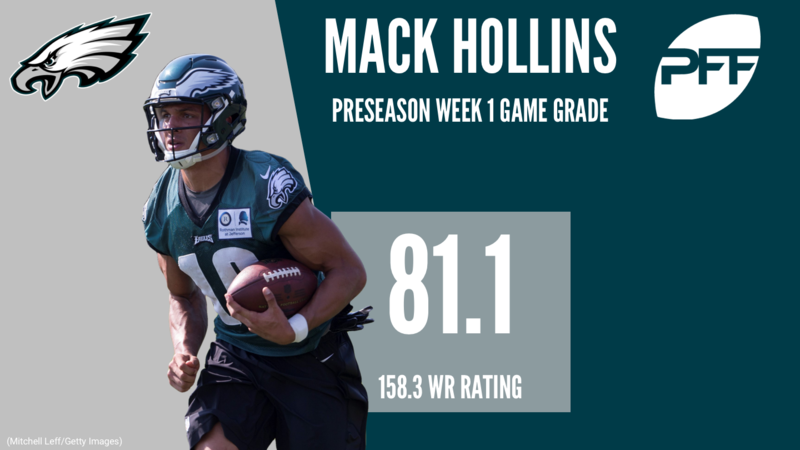 The debut of Hollins will give Eagles fans plenty to get excited about. A team that has been crying out for playmakers at the wide receiver position saw one in full flow against the Green Bay Packers, with Hollins catching a pass, delivering a couple of stiff arms and ploughing his way 38 yards for a touchdown the highlight of his day. He finished the game with four catches for 64 yards and a touchdown, breaking three tackles along the way and a perfect 158.3 passer rating when targeted. Peterman’s performance was enough to officially promote him up the Buffalo depth chart after the game, and he is now entrenched as the Bills second-string quarterback, leap-frogging veteran T.J. Yates. Peterman was excellent under pressure in college, but against the Vikings he completed 76.5 percent of his passes when kept clean in the pocket. Henderson finished his preseason debut against the Bears, with an impressive 82.6 overall grade on 25 snaps, including an 83.5 rushing grade. Henderson ranked third among rookie running backs who saw at least six carries this week with an average of 4.29 yards after contact per attempt; and he was second among the group by forcing four missed tackles. Qualls led all players in Philadelphia’s preseason opener vs Green Bay with an 89.1 overall grade, largely because he was absolutely dominant as a pass rusher. Qualls’ 17.9 PRP ranked fourth among all defensive interior players this past weekend, he tallied five total pressures on just 21 pass rushing snaps. With Aaron Donald absent, there was extra playing time to be had along the defensive line, and sixth-round rookie Smart was the player to take advantage of it, logging 37 snaps (the most among any front-seven player on the Rams), and notching a hit, three hurries and a batted pass on those snaps. Smart was a consistent disruptive force against the Cowboys and could push for regular season playing time quickly. 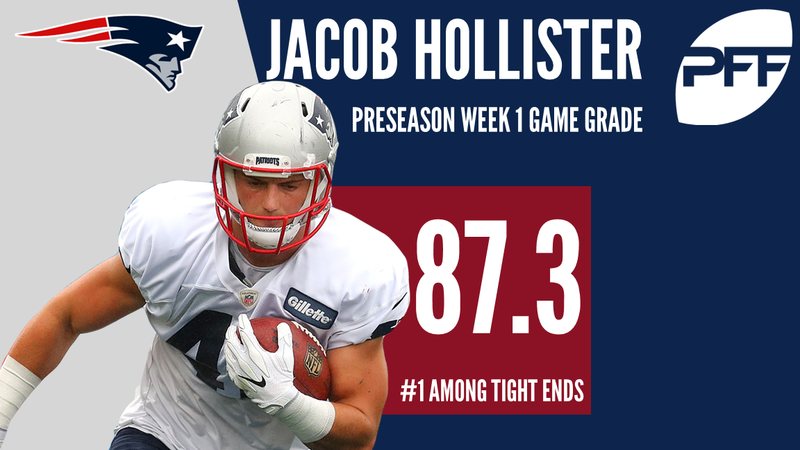 Hollister led all tight ends who saw at least five targets last week with an average of 3.63 yards per route run, six of his nine receptions came in the slot where his 4.26 yards per route run led all tight ends. Hollister was targeted deep once, hauling the ball in for a 38 yard catch and he didn’t drop a single one of his seven catchable targets. Nobody on the Vikings defense notched more snaps in the preseason opener than Tashawn Bower, who logged 47 plays, four more than anyone else, and who could blame the Vikings the way he was taking it to the Buffalo backups? Bower notched a sack, a hit, three hurries and a batted pass on 36 pass-rushing snaps, but also three defensive stops and did very little wrong over the entire game.